Fish and grilling are two of my favorite duo during this time of the year. We as a family are not big time fish eaters. But somehow after our stay in the Southern Coastal Regions of the country we get hooked to grilled fishes. The intense heat of the grill transforms tender fish into something pretty special. 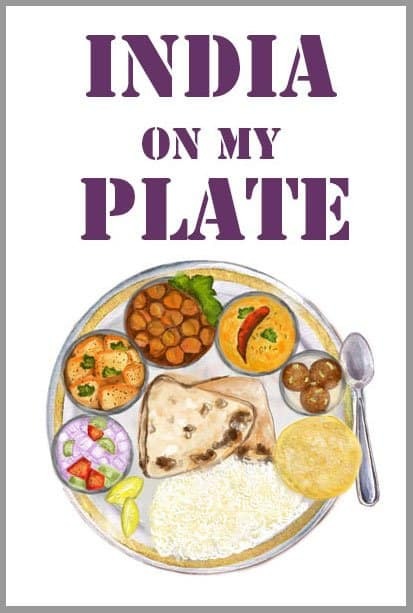 And for me as a cook, who is not very familiar with the nitty-gritty of cooking a typical fish curry, grilling is the best way to serve fish for a meal in no time. 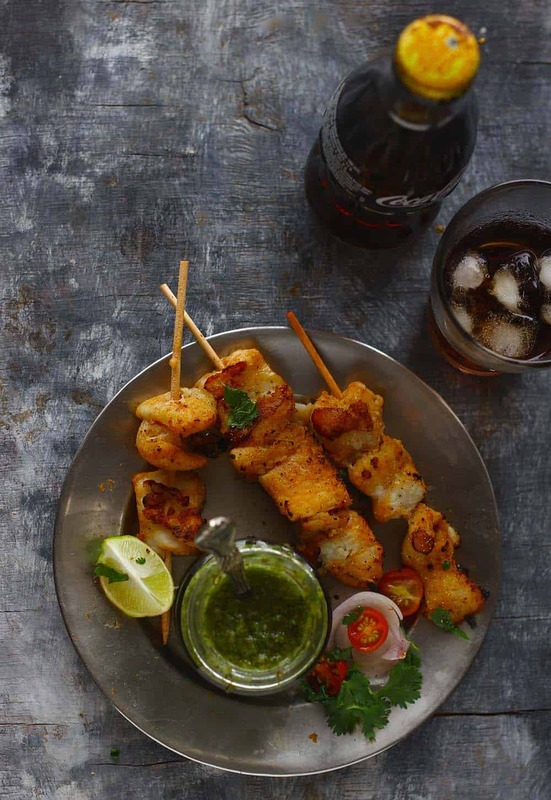 The hint of smoky flavor underneath the spicy marinade layer is what compels us to make Fish Tikka again and again. When we as a food-loving couple, think of dinner dates, one alternative is to dine at romantic restaurants or the second course of action is to plan romantic dinners at home. We usually go by the second choice. With fish set on the grill, a hearty bowl of pasta on the stove and a fresh bountiful salad for the side dish is our idea of a perfect dinner at home. Husband is responsible for the selection of wines to accompany the meal and of course the background score. The aroma of the grilling fish engulfed the air surrounding the dining area. To many Pasta and Fish, may not sound a delicious combination especially for a romantic dinner date. 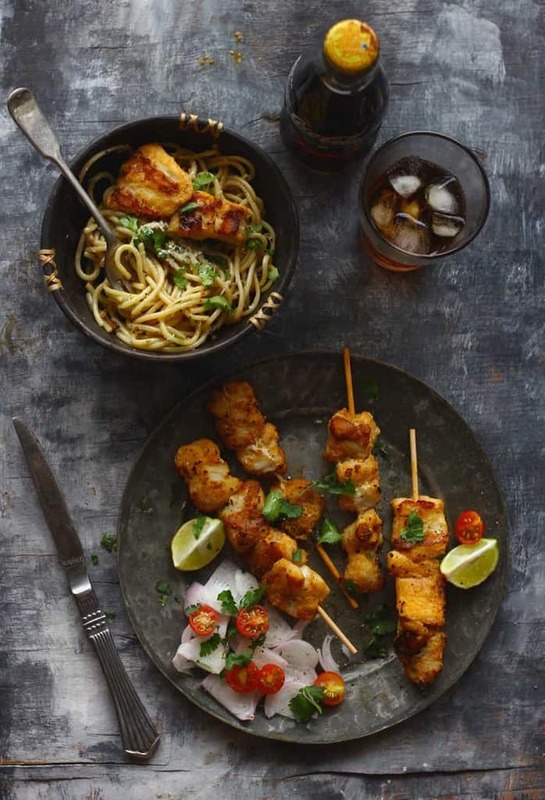 But a quick to prepare Fish Tikka along with a bowl of flavorsome Spaghetti Aglio Olio is the kind of meal you need for summers. Also, we always aim at a mess and hassle-free meals for a dinner date. We love the contrast between the bold Fish Tikka and the light Garlicky Spaghetti. The light smoky flavor of the Tandoori Fish Tikka pairs so nicely with the pasta and the salad. 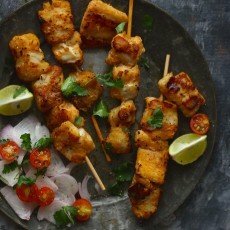 If you’ve got a bbq coming up or are just looking for an excuse to fire up the grill, try this Fish Tikka Recipe. 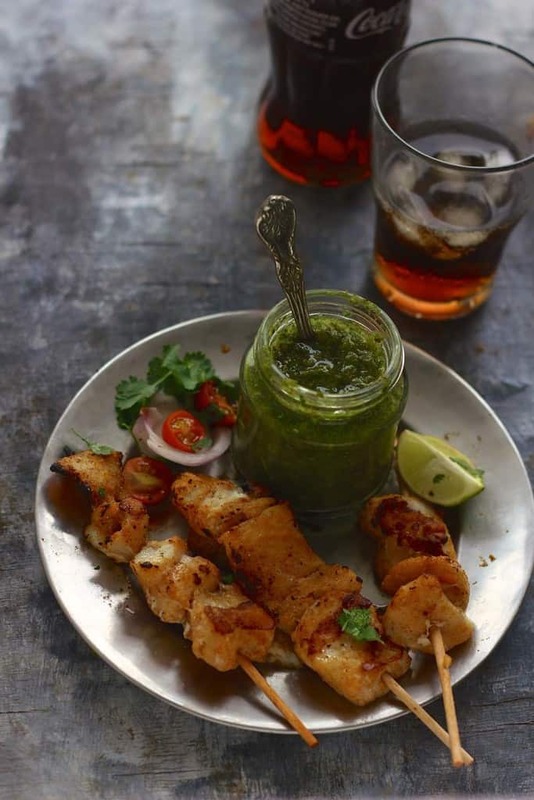 Another favorite from the grilling section is the Tandoori Chicken Satay. This summer you must try these recipes. If you’ve got a bbq coming up or are just looking for an excuse to fire up the grill, try this Fish Tikka Recipe. Learn how to make Indian style grilled fish in few simple steps. Clean and wash the fish fillets. Cut the fish fillet into square bite size pieces. In a mixing bowl, combine fish pieces with besan, yogurt, spices and salt. Combine nicely so that all the pieces are quoted well with the marinade. Let the fish pieces rest in the marinade for 30 minutes in the fridge. Heat your barbecue or charcoal grill or grill pan. While chicken is being marinated soak bamboo skewers in water for 10 minutes to prevent from burning while grilling. Pat dry the skewers and grease nicely with oil. Thread marinated fish pieces into oiled skewers and make sure not to leave any space between each piece while threading. Grill the skewered fish in the barbecue/charcoal/oven or in the grill pan. Keep on brushing the fish skewers with oil. Cook till fish pieces are cooked and turn golden from outside. Keep on turning the skewers while grilling and basting with the leftover marinade. Squeeze lemon juice on top and serve with green coriander chutney. These look delicious, great on the bbq! That is the Indian Green Chutney loaded with mint, coriander and garlic. 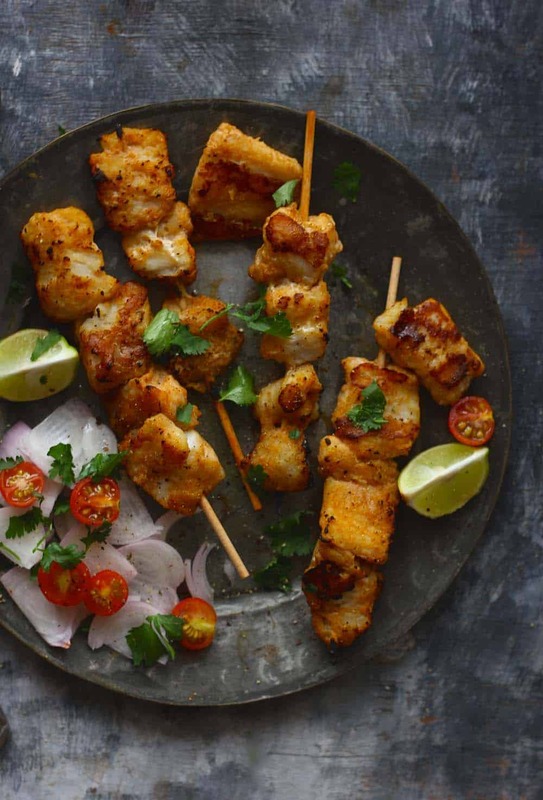 These tikka look great….how do you grill at home? I want to get a grill but don’t know which one to invest in. Any suggestions? Thank You. You can use the non-stick grill pan/oven/bbq either of these methods work for these fish tikkas.